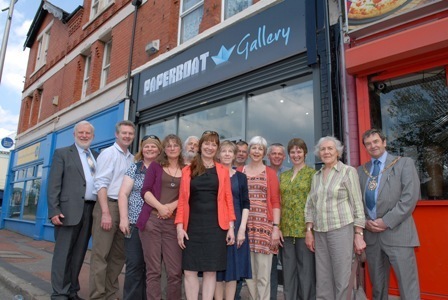 17 June 2013 A new art gallery has officially opened its doors on Whitby Road, Ellesmere Port – thanks to a scheme to bring empty properties on the street back in to use. The Paperboat Gallery, run by local artist Sonja Moss-Dolega, exhibits a range of art and offers local artists and craftspeople the opportunity to display their work, alongside courses in pottery, painting and textiles. Andrew Miller MP, gallery owner Sonja Moss-Delega, Mayor of Ellesmere Port Councillor Bob Crompton and Town Centre Improvement Manager Jochem Hollestelle. The owner of the property applied to the Council for a refurbishment grant for the long term vacant shop in the old high street of Ellesmere Port. The shop used to be a newsagent until it closed its doors in 2007, after 23 years of trading. In return for the grant, the landlord has offered the Council the opportunity to nominate an organisation to use the shop on a peppercorn rent for two years. Owner of the gallery, Sonja Moss-Dolega, said: “In the few weeks since the Paperboat Gallery opened its doors, the gallery has swiftly become a hub for local artists. We’ve already been very busy with requests from people keen to share their passion, talk to like-minded people and look for an opportunity to sell or exhibit their work. “This is a great opportunity for my team and I to put Ellesmere Port on the arts map. Our aim is to bring the arts to the town and its people. In the gallery, we exhibit all kinds of artwork for sale and we also want to put on a variety of courses in things like pottery, drawing, painting and textiles. “The art team is also going to reach out to the community by delivering art-related projects to educational institutions and organisations which are caring for the elderly and disadvantaged younger people. 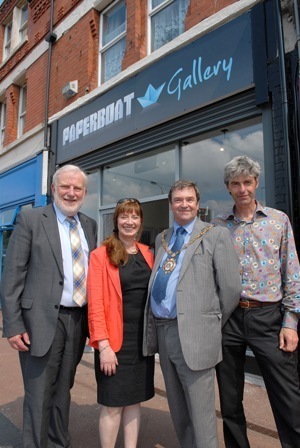 Andrew Miller MP, who officially opened the Paperboat Gallery, said: “The new art gallery in Whitby Road has been created in an shop which was closed for six years and displays the right ambition that is needed to improve our town centre. “It is important that art, culture, science and engineering get opportunities to offer residents the best, promote creativity and support the growth of the local economy. I hope the Paperboat Gallery’s new shop front sets new standards for other shop refurbishments in the high street to improve the appearance of this gateway into the town. Looking to target long-term vacant shops in the old high street of Whitby Road, the grant scheme aimed to bring properties back into use, improve the appearance of the street, help increase footfall for the other shops, and support the regeneration of the wider area. Sonja beat off stiff competition to use the space and set up a Community Interest Company to manage it. Mayor of Ellesmere Port, Councillor Bob Crompton, said: “Whitby Road has a considerable number of properties that have remained empty for a long time, something I know local residents would like to see change. “The art gallery will help to generate interest and footfall for all shops on Whitby Road, and as it is being set up by a local artist, will strengthen community links. It will really strengthen Ellesmere Port’s position on the cultural map. Residents have also raised the issue of empty shops in the town centre via the Council’s Our Place Neighbour Action Groups.